4:15 AM. Shower, coffee, kiss Daisy good-bye. Rain and cold and dark. Queens Boulevard, Brooklyn-Queens Expressway, Grand Central Parkway, Triboro Bridge, Major Deegan, Thruway, Tappan Zee Bridge, Thruway, sunrise, Exit 23. Home, feed cats, drop off stuff, pick up other stuff. 787, I-90, Northway, Exit 6, Route 7, Rosendale Road. Lock 7. King Eider!!! The juvenile male that John Hershey, a local birder, found and posted about on the local listserv. Not only year bird number 305 but also a lifer! Then off to work. Not a bad Monday morning. And especially not bad considering that on Sunday Jory and I had unsuccessfully scoped through hundreds of Common Eider out at the tip of Long Island hoping to find a King Eider hiding among them and here one was not fifteen minutes out of the way on my way to work. 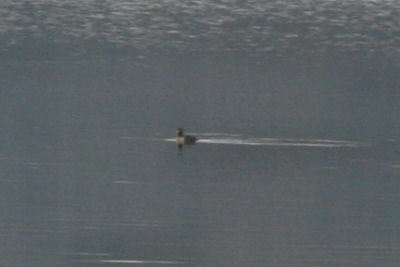 A better picture of a King Eider and some interesting research on the species can be found here. Update: Jeff Nadler, bird photographer, just posted these shots of the juvenile King Eider. Nice. That would be a new one for me. wish the eider were an adult male. I assume Will is just giving you a hard time. I can’t imagine that anyone would keep a King Eider captive. Nice bird! It’s a little known fact, but Corey has done his big year in an aviary.